Cemeteries are not intended to be places of great joy. That is definitely the case in Newark. With the exception of Mt. Pleasant, Fairmount, Holy Sepulchre, Evergreen and a few others, there have been continuing problems and heartbreak linked to Newark's final resting places for well over a century. Some of these problems have been financial, some political and some have simply come from a vanishing community which once held local sway and now may have little knowledge of its own recent history. The dreams which the 19th century immigrants cherished of improving themselves actually accelerated their exodus to a suburb, or even some far corner of the nation. This has left America a highly mobile country with too few roots. Drive through the larger burial grounds at Mt. Pleasant, now Newark's oldest remaining cemetery. The names read like a blue book or social register of mid-19th century British, Scottish or Irish captains of industry. Fairmount Cemetery also is part of that tradition, the place where the Schweickarts, Heises, Doerzbachers, Vorts and Fiores are buried. Across town Evergreen Cemetery occupies parts of Hillside and Elizabeth as well as Newark. It not only includes descendants from the ancient East Jersey Proprietors but also the patrician founders of Elizabeth and a great mix of all the nationalities that built Newark, Elizabeth, Essex and Union alike. Except perhaps for renewed interest in reviving the decimated Woodland Cemetery and attention being paid to many of the small Jewish burial grounds along Central Avenue and in the vicinity of the brewery and airport, many former Newarkers and their final resting places have been forgotten. As land became more valuable, and as small downtown church congregations struggled with mounting upkeep costs, decisions had to be made about re-interment of the graves of Newark's founders. 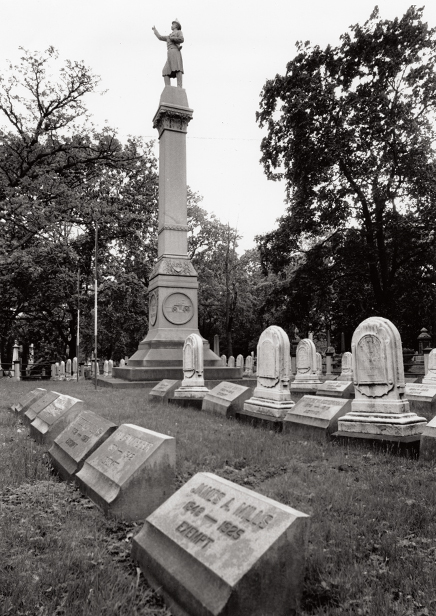 In the mid-1990s, in an attempt to list some of the city's cemeteries, James Osbourn of the Newark Public Library's New Jersey section checked city atlases and maps and compiled a partial list entitled 'Old Newark Cemeteries.' He found the following sites: Old First Burial Ground, located along the western side of Broad Street opposite the present church building; the Old First Church Cemetery, now a parking lot behind the present church building; the Second Presbyterian Church burying ground at Plane Street; the Third Presbyterian Church Graveyard along Halsey, William and Hill streets; St. John's Cemetery, formerly located at Broadway and Fourth Avenue; Fairmount Cemetery between Central and South Orange avenues; Woodland Cemetery, west of Bergen Street; Mt. Pleasant Cemetery, along Broadway; the Colored Cemetery on Wall Street between Ferry and Paterson streets; the Franklin Street Methodist Episcopal Church Cemetery at Tichenor's Lane and Railroad Avenue; Potter's Field, also known as Floral Rest, that eventually became prominent in the news when it was turned into a dumping ground; The Coeyman Family burial site at the Passaic River at Grafton Avenue; and Halsey Street Methodist Episcopal Church. To this basic list even more sites which do not appear on any area map and which have been forgotten with the passing of time could be added. Newark's two oldest burial grounds belonged to Old First Church, the township's founding institution. The building on Broad Street today is its third home. The original church building was located at Broad and Market streets. A second building was later constructed across the street from the present church building, and a burial ground developed to the rear of this structure, which came to be known simply as the Old Burial Ground. When the present building opened in 1791 a new cemetery was established to the rear of it. But for more than a century and a half the first cemetery behind the second church building on the west side of Broad Street was the community's grave yard. It contained the graves of the founders and early settlers, including bodies of ministers such as Rev. Abraham Pierson and Alexander McWhorter, township founder Jasper Crane, Revolutionary War fighter Stephen Hayes, New Jersey Supreme Court Justice Elisha Boudinot, Dr. Cornelius Baldwin, colonial surgeon, and hundreds of others. From 1666 until about 1800, the Old Burial Ground was the final resting place for Newarkers, both high and low. By 1800, it fell into disuse, and by 1820 it had become a place . . . 'where cattle grazed, and innkeepers dumped garbage and cooks sharpened knives on the gravestone.' At an 1820 town meeting, the purchase of a new town cemetery along the old Ferry Road in the east end of town was authorized. Relatives and family were asked if they wanted bodies transferred at town expense, but there were few takers. Eventually, the first burial ground was abandoned and Branford Place was cut through the site, causing tremendous ill feeling in both church and town. To many, the closing of the first cemetery and the transfer of the founders' remains to Fairmount was a disgrace. On one side people asked, 'How could this happen?' The reply was that progress dictated the move. In the long run, the pressure for downtown development won out. The church's governing body appealed to the New Jersey Court of Errors and Appeals, which allowed the graves to be moved to the large crypt in Fairmount Cemetery marked by a statue of Robert Treat. There it rests today. Newark's second oldest cemetery, the one behind the present Old First Church, began to be used some time before the close of the 18th century and remained open until 1959 when Superior Court Judge Mark A. Sullivan Jr. approved the church board of trustees' plan to convert the three-acre plot into a modern revenue-producing car park to hold 500-600 automobiles. In place of the once bucolic early American burial ground, a 30-by-160 foot graveyard was created behind the church set off by a massive headstone listing the residents of the once adjoining burial ground. Officials said the cemetery should be closed because it was in very bad condition and had not been used since the 1850s. Further interments were prohibited in 1887. A 1951 Newark News article described cemetery conditions as abominable and noted the overgrown monuments, fallen trees, grass and weeds as tall as a child. Trash routinely was tossed out of windows of the adjoining buildings. The final so-called nail in the graveyard's coffin was the judge's statement that the cemetery was so dilapidated that restoration efforts were at that point impractical. While a few Newarkers, including the mayor, complained and felt the city should save the landmark, the graves of the early Newarkers were again moved into a single tomb. This second re-interment occurred approximately a half-century after the removal of the original burial grounds under Branford Place.